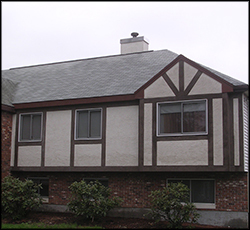 We use a two-coat stucco system with a hand-troweled Portland cement base coat and a pre-mixed acrylic finish coat. The acrylic coat is applied in a choice of textures and colors. Trowel on a first coat of machine mixed cement, sand, fibers and plasticizers to the entire work area. We refer to this as the base coat. Float and smooth the base coat to receive the finish coat. The base coat will dry for 5-7 days before the finish coat is applied. Trowel on the finish coat of a premixed acrylic stucco. 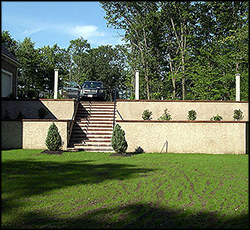 The finish coat will give the appearance of acrylic stucco with the durability of cement stucco. 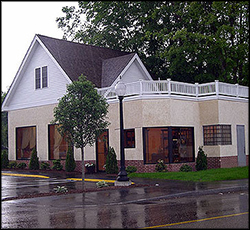 The finish coat is offered in a course sand or worm texture. For more information about acrylic hardcoat stucco from the experts at New England Brickface, please contact us here or call us directly at 508.400.1241.